Blogging about one’s vacation is not without repercussions. If you go to cooking school in Italy, for instance, the friends and family who’ve been reading your blog expect you to cook for them when you return home. Last month, I spent a week at The Awaiting Table Cookery School in Puglia with my friend, Anne Rudden Press. I know Anne through my college roommate, Pamela Stewart Burke, who has been close friends with Anne since grade school. After reading our posts from school, Pam felt entitled to get at least one meal out of us, as she is the reason Anne and I are friends in the first place. The location of the reparations dinner was Anne’s house in Tenafly, New Jersey, a short trip just over the George Washington Bridge for me, and over the Tappan Zee bridge for Pam and family. 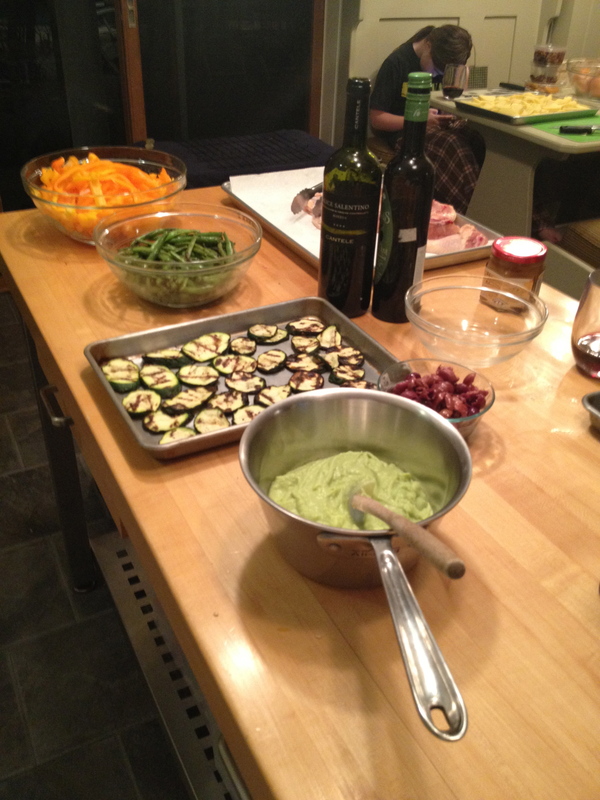 Antipasti: We adapted the “fae e fogghie” recipe (cooked, pureed fava beans) we learned and served it as a dip with grilled zucchini, beans, portobello mushrooms and escarole. I arrived at Anne’s house in the early afternoon and we set off for Jerry’s Homemade, a large Italian specialty market with a great selection of cheeses, meats, and wines in nearby Englewood, NJ. It’s a treat to just roam the crowded aisles and check out all the great stuff. 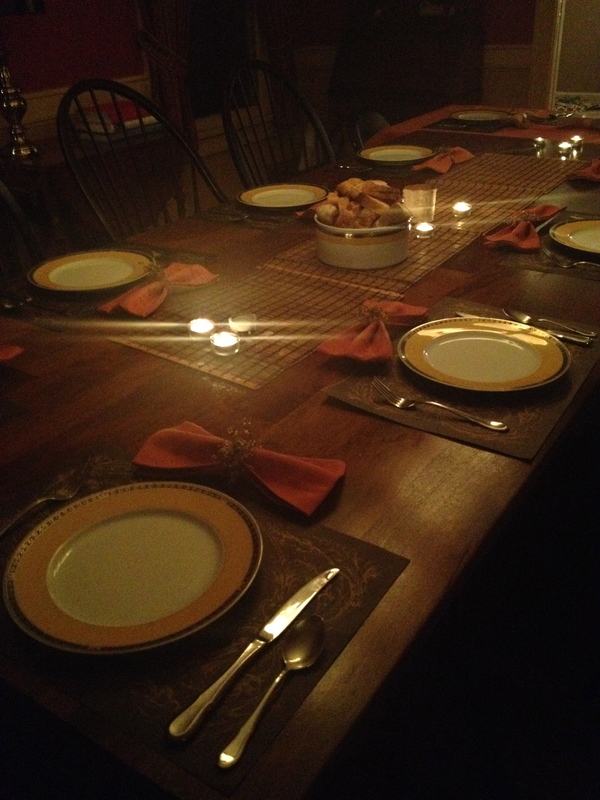 Back at Anne’s, our dinner preparations began in earnest. Lucky for us, Anne’s daughters (the “little” girls), Sophia and Emily, were eager to pitch in, as were her step-daughters (the “big” girls), Danielle and Lauren. Not only was it great to have so many hands helping to make the meal, the girls were wonderful company and we had an absolutely lovely time cooking together. I got to straight to work on the sauce, using a recipe my good friend Bob Huntley imparted to me. Simply saute thinly sliced onions in butter over a low flame until they are super soft. Add Italian sausage to the onions, breaking the meat into chunks as it browns. Once the sausage is cooked, add a large can of whole, peeled tomatoes and their juices, and then let the whole thing simmer, breaking up the tomatoes with a wooden spoon as the sauce simmers. Delish. When we made the pollo al vincotto at the school, we both knew immediately we’d cook it again. It’s chicken thighs and legs cooked in red wine with olives. The secret ingredient (well, not that secret since it’s in the title of the recipe) is vincotto, which is grape must that has been cooked and reduced to about a fifth of its original volume (according to Wikipedia, the font of all my knowledge). Unfortunately, Pollo al Vincotto wasn’t included in the recipe booklet we received from The Awaiting Table, so Anne Facebook messaged Silvestro Silvestori, the school’s founder, and asked nicely for the recipe, which he kindly provided. 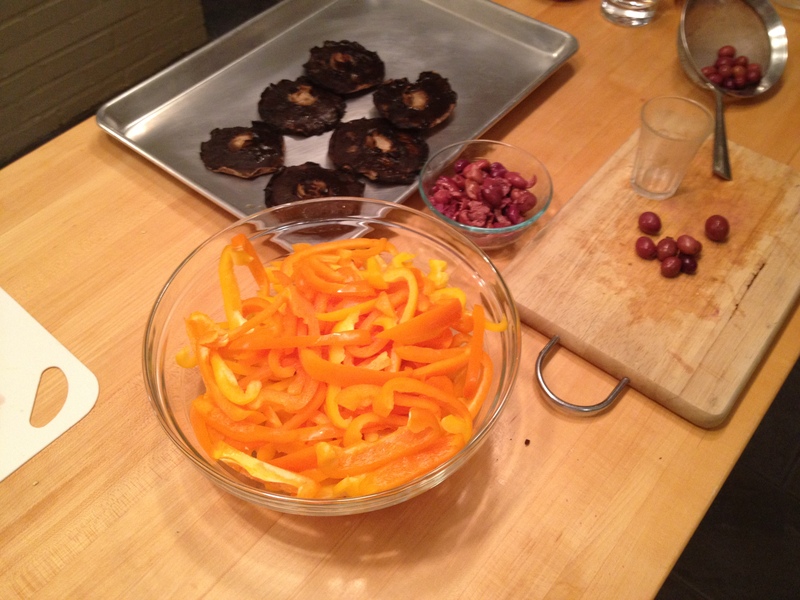 Once the chicken was browned, we added a bottle of red wine and pitted olives. And then we stirred in the vincotto and let everything simmer together. 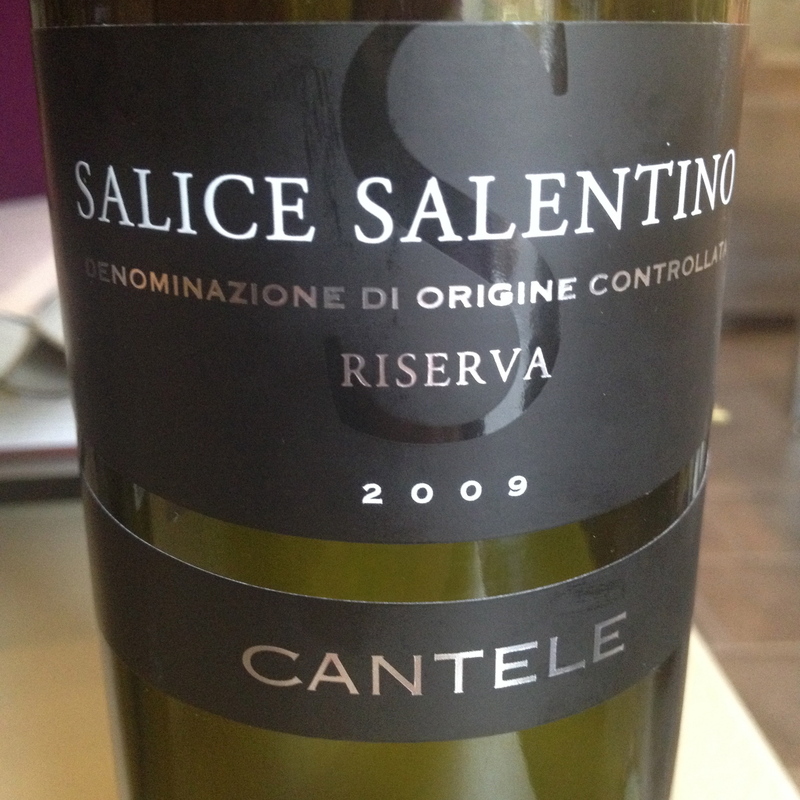 We cracked open a nice bottle of Salice Salentino and caught up with our friends over the antipasti. The fava been puree was well-received, and also provided ample opportunity for numerous Hannibal Lecter jokes (see video below). Finally, it was time for dinner. Lucky for us, we didn’t disappoint. 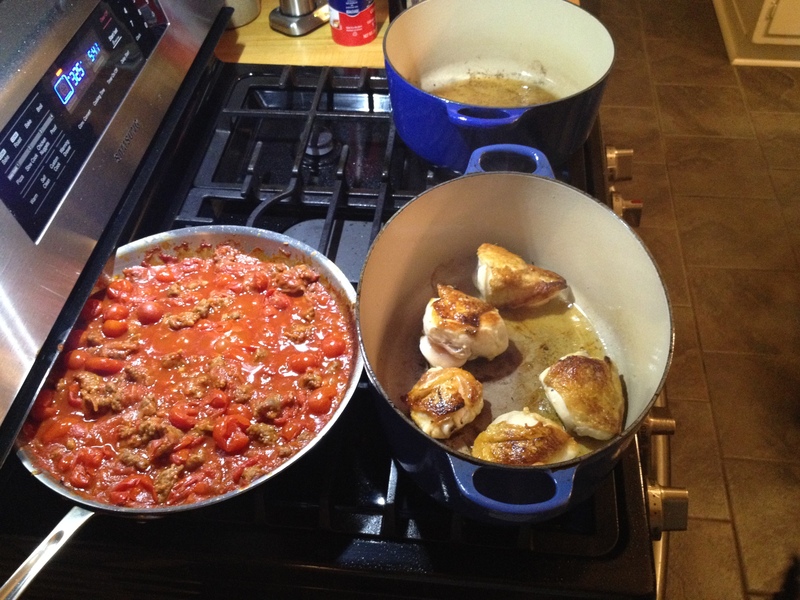 The pasta and chicken were both huge hits, as were the sandy potatoes. Both Anne and I were thrilled our command performance went so well. We even promised to make pasta with Pam next month. Stay tuned! 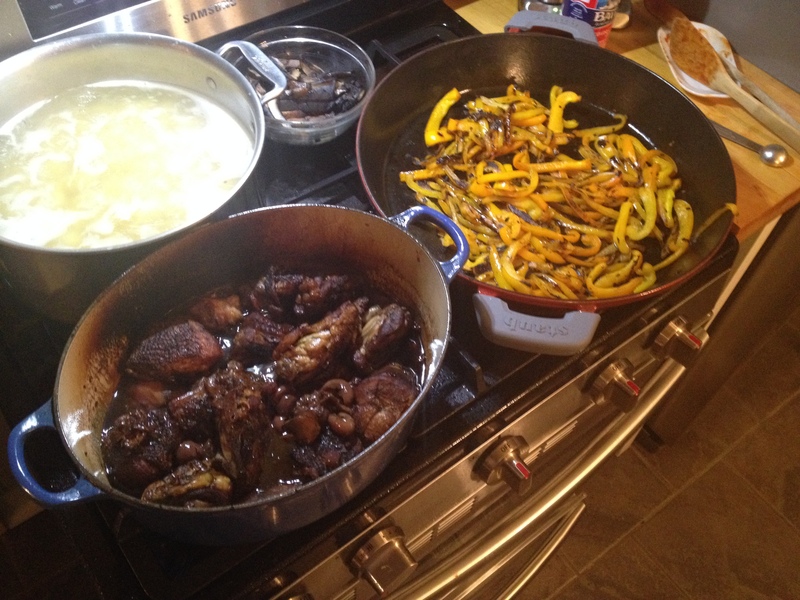 I need the recipe for the Pollo al Vincotto – it looks and sounds amazing!!! This sounds absolutely yummy. You are welcome to cook at my place any time and we are all happy to help! Next time, I need closer-ups of all the food dishes much like the close up of the wine…I would love to see the detail! I think “your people” in Buffalo would love Pollo al Vincotto!!!! Hope to make it for you soon!